Have you ever looked at people who attract friends easily and wondered what their secret was? Something that if you could just put your finger on would help you go from being lonely to having many close, loving, fulfilling friendships. 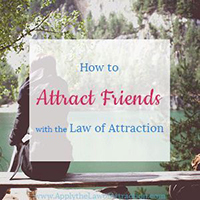 Let me share with you their secret to attracting friends with the Law of Attraction. It's really quite easy for you to use it to make new friends. People who make friends easily attract others because of how they think. They are positive thinkers who focus on doing things that make them feel good about themselves. This allows them to have a vibration that is open and welcoming. It makes people want to be around them, like moths to a flame. Now, you might be thinking that you're a normally happy and optimistic person. If that's all it is, why are you still lonely? It's normal for lonely people to unintentionally have negative thoughts and low vibrations when it comes to friendships and to themselves. If you think close friendships aren't happening for you, your thoughts create a vibration that blocks you from having the friendships you want. Remember that the Law of Attraction draws to you what you focus on. 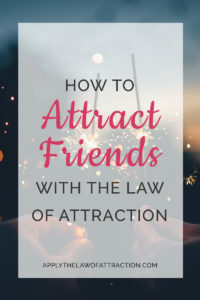 When you think close friendships aren't happening for you, you are using the Law of Attraction to create a lack of close friendships in your life. It is delivering exactly what it thinks you are asking for – no close friendships. I know this isn't what you want to create. You know it isn't what you want to create. But the Law of Attraction doesn't know! You might have a lot of good reasons for not having many friends. You might work long hours and have little time to meet new people. You may have a daily routine that you don't deviate from, thus always seeing the same people everywhere you go. You might be busy with family and have little time for yourself, let alone new friends. But the more you feel the need for close friendships, the more you are noticing how isolated you are from others. When you notice the lack of friendship, you feel lonely and (unintentionally) think negatively. You might start looking around at others, comparing yourself and only going further down in the spiral of negative thinking. You might begin to start thinking you aren't good enough, there is something wrong with you, no one likes you… This only pushes you further away from the close, loving fulfilling friendships you want to attract. If you want to get friends with the Law of Attraction, you have to do what people with many friends do. You've probably noticed certain qualities that people with many friends have. They're all-around pleasant people who usually have a smile on their face and a kind word on their lips. Positive thoughts give them the vibrancy that draws people to them. You don't have to go around smiling at everyone and acting like you're in a great mood, if that isn't who you are. But you do have to focus on your thoughts. If you think “no one likes me,” “why would he/she want to be my friend,” or similar negative thoughts, your body posture and facial expressions will reflect your thoughts. Your energy will dip down and you'll give off a negative vibration that will repel others. If you persist in these negative thoughts, you can put up defensive barriers that keep people away so that they can't reject (and hurt) you. The very thing you want is closeness and people around you, but you push them away by rejecting them before they can reject you. What Friendships Will You Attract with the Law of Attraction? Focusing on your thoughts is just one element of making new friends. It alone can produce great changes in your life. But what kind of friends will you attract? You might have people swarming around you, but are they the kind of people you want to be around? This is an important step because as you do it, you're naturally shifting to positive thoughts about friendships and aligning yourself with the type of people you want in your life. Make a clear list of the friendships you want to have. Avoid the general term friendships. Focus on the exact words that match what you're looking for in a friend. Perhaps it's trust, laughter, fun, common interests… Write down what it is you truly want. Make sure you include what you want to do with your new friends. Will you talk on the phone? Go shopping? Play games? Be each other's wingman? Feel free to let your mind wander as you do this exercise. Daydream about what you might say to each other. Imagine what it would be like to laugh about things that only you and your friends get. Think about how nice it will be to feel supported through good times and bad because your friends truly have your back. Also consider what you might do differently when you have close, loving friendships. How will new friends change you? What can you do to be that person today? There's no need to wait. The Law of Attraction likes speed. Acting like that person today aligns you more closely with the friendships you desire, drawing them to you even faster. As you do the above exercise, you'll find yourself feeling more positive, eager and open to meeting new people. You might be inspired to go someplace new, change up your routine, or to smile at a stranger. Follow the nudges you get. They are helping you to attract the people you want in your life. What if You Hit a Bump in the Road? As you go through this process, you might find yourself slipping back into negative thinking from time to time. It's okay. Those negative thoughts have been helping to keep you safe for a long time. They have been protecting you from rejection and other bad scenarios. But you don't need them anymore. They have served their purpose and it is time for them to find a new role. Be willing to release these old patterns. Creating a list of all your good qualities also helps to shift them. What do you like about yourself? What would you like your friends to say about you? Treat yourself the way you want your friends to treat you. Love, trust, and accept yourself and others will do the same. As you change your thoughts and beliefs, you will create a new reality where you attract friendships easily. What about when you had attracted in the past demanding, “vampirizing” friends and have issues with fear of being invaded and so block the attraction because of this? How to get freed from this fear which blocks it and attract friends who respect your boundaries? You should reread this post and follow the tips in it. It does tell you how to get rid of your blocks and attract non demanding vampirizing friends. All the above can work. The steps are the same. It’s about changing your thoughts. The articles Dave suggested can help too. Thank you Elizabeth, Dave and James. Why does it seem like it takes no effort at all to manifest what we don’t want but to get what you really want it’s this huge process? Thank you so much! Recently I’ve been wanting to create new friends also a great romantic relationship. Can I ask you for advice and insight on missed opportunities? For instance, I felt like going to some party but my friend was really late that day but I was afraid of going alone..So after that, I thought I could’ve met a good guy if I’d gone alone..So I’m afraid if I just passed by a good opportunity.. what do you think of missed opportunity? I don’t think about missed opportunities. I don’t dwell on them as that continues to tell the story of a missed opportunity, allowing more missed opportunities to occur. Instead, I change my story of what happened and live from that story, allowing new opportunities to come in. Thank you for your comment. I’ve recently noticed that I got more obsessed with small mistakes and details when working with law of attraction. Can I ask you one more question relative to Law of attraction? In theory, law of attraction responds to our beliefs, thoughts and emotions. So Law of attraction responds to moment-by-moment vibrations?